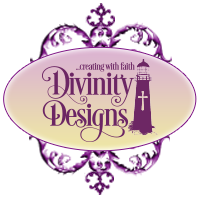 Divinity Designs, LLC Blog: Customer Card of the Day - Dianne Pratt! Customer Card of the Day - Dianne Pratt! Happy Wednesday, everyone! It's time to reveal the next ODBD Customer Card of the Day, but first I have a confession to make. I'm breaking the rules this week and will be sharing not one, but two beautiful ODBD creations by Dianne Pratt aka diannep575....double congrats, Dianne! This week, as I was scouting for customer cards over at Splitcoast Stampers, I fell in love with the first card which features the adorable little boy image from the "Precious Boy" set and knew I wanted to show it off it here today. Dianne's coloring is outstanding and I love how she incorporated several layers of polka dots with the beautiful framing. 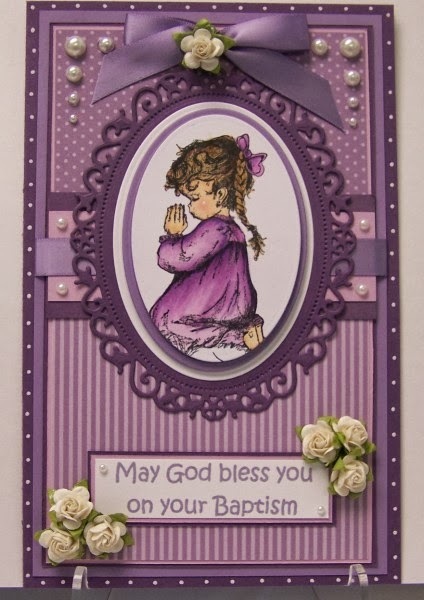 As I was cruising through Dianne's amazing gallery, I discovered another gorgeous card which featured the coordinating stamp set to "Precious Boy", called "Precious Girl", with a baptism sentiment from "Noah's Ark". Now you can see why I had to feature both, right? They were both super adorable and super gorgeous at the same time! Fabulous job on both, Dianne!! If you would like to see more artwork from Dianne, please visit her Splitcoast Gallery, diannep575, and leave some love while you are there! They are both so precious, lovely coloring and framing!! No wonder you had to post BOTH, Angie!! They are equally as gorgeous with all those lovely layers - WOW!! Dianne - congratulations on not one, but TWO stunning cards for Customer of the Day!!! Oh, Angie, what a wonderful Customer Card of the Day post today! Great choice! And I LOVE both cards and can see why you HAD to choose two! Congratulations, Dianne! You are amazing, and I love your coloring, layout, and lovely embellishments! Hugs! Great find, Angie! And what a great set of cards! Wow!! I'm totally speechless! Thank you so much and thank you Angie for letting me know. I LOVE these two sets and they are two of my favorite all time sets. Thank you again Our Daily Bread!! Dianne, both your cards are so beautiful!! Love the colors layouts!! Great job. Congratulations, Dianne--well-deserved spotlight! These are beautiful!